A black and white negative of a portrait of Mr. Robert Charles Adams. Mr. Robert Charles Adams (1914-2001) was born at Toronto, Ontario on September 24, 1914 and served in World War Two. He was President of the Royal Canadian Legion Branch 112 in 1963 and 1981-82. He died at Lindsay, Ontario, on December 4, 2001 and is buried at Riverside Cemetery, Lindsay. 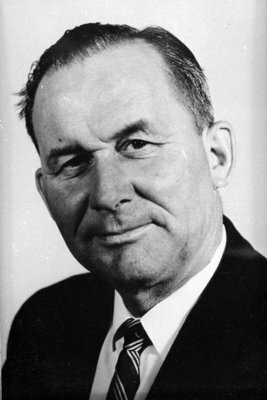 Robert Charles Adams, 1963, Photographer Unknown. Whitby Archives A2016_017_037A.